Gaastra PalmaVela is often described as a ‘practice regatta’ simply because it opens the Mediterranean racing season, but few crews left Palma today with any complaints that this year’s event lacked either intensity or quality of competition. Over the four days of racing the winds might have been less regular and reliable than previous years, but maintainde the tension to the end in most of the key classes. 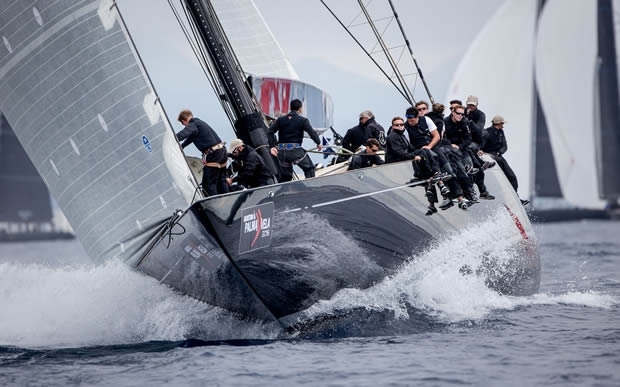 The nine strong TP52 fleet, revving up for their racing season, which starts in Italy in just over two weeks, had looked set to be a comfortable win for Quantum Racing. The 2013 and 2014 champion faltered with a sixth from seven finishers in the first race of the day, but a well-executed comeback in the seventh and final race ensured Doug DeVos’ team secured the Palma title, complementing the Copa del Rey MAPFRE title they won on the Bay of Palma in August last year. Competition in the 11 strong Wally class also went to the wire. Victory in the last race, contested in a light, shifty breeze, was enough for Jean Charles Decaux’s Wally 77 J One to win overall by just a point from Philippe Ligier’s Wally 80 Ryokan 2. Under handicap in the Maxi class the J Lionheart was simply unstoppable, her crew led by Bouwe Bekking winning all six of their races. And in the One Design classes the winners in the Swan 45s Christian Plump’s Elena Nova with three firsts and a second. The regatta delivered a good range of conditions, even if the sunshine and sea breeze did not prevail as they usually do on the Bay of Palma. Summing up the challenges and reasons the regatta exists, the Real Club Náutico de Palma’s Sports Director Manu Fraga commented: “We are pleased with the participation, over 110 entries from 17 countries turning out on the racecourse. For us it is very important that the international racers choose to come here and open their season here, with us at the Gaastra PalmaVela. This was a regatta created for the Maxi and Wally classes and it is still well supported by those fleets and the TP52s. And the response of the local fleet is also good. “It is not easy to coordinate four race courses, with boats ranging from 3 to 43m... We have to adapt the racing areas to the needs of each fleet: professional, amateur, adaptive sailing... But all in all, the things went well, considering the weather didn't help. Normally, May brings 70-80% of chances of sea breeze, but in the end that didn’t really happen for us all! The Wally class title was wide open when the fleet went afloat in the morning for their two scheduled windward-leewards. If the changeable, mainly light conditions made it tough for the big boats to sail to their ratings, the intensity of the fight between the Wally 77 and 80s undoubtedly helped them raise their level. Philippe Legier’s Wally 80 Ryokan was the best scoring boat of the day with a first and second, but J One’s race 3 victory earlier in the regatta caused her to prevail. Quantum Racing clinched the Gaastra PalmaVela TP52 title with a victory in the last race, proving they are getting ever-closer to being ready for the 52 Super Series which starts in Scarlino, Italy in just under three weeks time. Azzurra, winner of this regatta last season, and the world and 52 Super Series champions served a salutary reminder to Quantum Racing – not that she needed it – of how close this year will be. The team which represents the Yacht Club Costa Smeralda won the first race today, leading off the start line. By taking fourth in the final race they secured second overall some six points behind Quantum Racing’s winning score. Vladimir Liubomirov’s Bronenosec finished strongly with 3,2 today to take third. Lionheart kept its unblemished winning record intact in the small Maxi class winning both windward-leeward races. The ‘up and down’ programme was a key reason for the J Class team’s decision to compete here, representing excellent training for their upcoming season and beyond. In the J/80 class five wins from eight starts was the foundation for overall victory for Javier Chacartegui Cicerol’s HM Hotels. Javier Scherk and his crew closed out their win in the Dragon class on Gunter and David Barber’s Fine Fettle won the Flying Fifteen class. In the IRC Class Ruedi Huber’s Baltic 50 Music finished as she started on top of the class, winning by two points. In ORC Class 0 the victors are Dr Luis Senís’ Swan 45, in Class 1 Fyord Maverta, a Rodman 42. Class 2 saw Scott Beattie’s British crew on the J/97 Just the Job fight back from an OCS in the first race to win their class. The First 31.7 Sirpy triumphed in Classes 3-4.